GARY WAS BORN IN SPRINGFIELD MASSACHUSETTS IN 1960. THE YOUNGEST OF THREE, GARY MOVED TO BROOKLYN NEW YORK WITH HIS FAMILY TWO YEARS AFTER HIS FATHER DIED IN 1964. 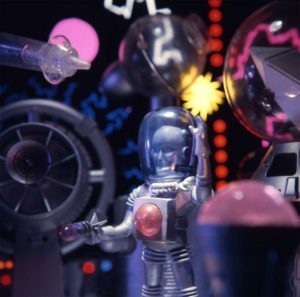 ONE OF THE EARLIEST MEMORIES THAT GARY HAS IS SITTING ON HIS GRANDMOTHERS LIVING ROOM FLOOR IN FRONT OF HER GOLD COLORED COUCH AND OPENING ALL SEVEN OF THE OUTER SPACE MEN FROM THEIR BLISTER PACKAGES. THERE WAS SAWDUST ON THE FLOOR AND ALMOST NO LIGHTING WITHIN THE LONG DARK NARROW CORRIDORS OF SHELVING. IF YOU LOOKED CLOSELY THERE WERE STACKS OF AURORA MODELS SUCH AS FRIGHTENING LIGHTNING’S, GLOW IN THE DARK’S, GIGANTIC FRANKENSTEIN, DRACULA’S DRAGSTERS AS WELL AS MUMMY’S CHARIOTS. EVERYWHERE YOU LOOKED WERE ICONIC TOYS LIKE MAJOR MATT MASON AND CAPTAIN ACTION AS WELL AS G.I. JOE AND MATCHBOX. SOAKY’S, GUMBY, SLINKY’S AND EVEN SLOT CARS. IT WAS A CORNUCOPIA OF THE FUTURE HOLY GRAILS OF TOY COLLECTING. ON ONE SMALL AREA OF A WALL WHERE RODS CAME OUT FROM THE PEG BOARD WERE HANGING THESE NEW CARDED ALIENS THAT NOBODY HAD EVER SEEN THE LIKES OF BEFORE. THEY WERE SEVEN WARRIORS REPRESENTING THE BEST OF THE BEST FROM EACH OF THEIR RESPECTIVE SEVEN PLANETS IN OUR SOLAR SYSTEM. 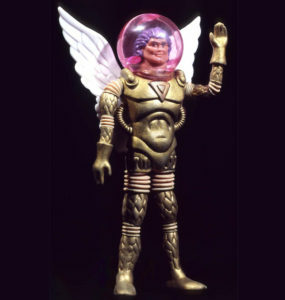 THEY WERE THE OUTER SPACE MEN.THE IMAGE OF THEM IN THE WINDOW OF THE TOY STORE SIMPLY SAID "THEY'RE HERE." EVERY MOMENT OF JOY AND PLEASURE, FUN AND EXCITEMENT, EVERY MOMENT OF BROKEN WIRES AND BUSTED PEGS FROM THE HELMETS AS WELL AS EVERY AUDIBLE SNAP OF BROKEN ACCESSORIES WAS BURNED INTO GARY’S MEMORY. EVERY INVASION OF EVERY PLANET, BATTLING EVIL AND THOSE WHO WOULD TRY TO DESTROY THE EARTH AND THEN DEFEATED WAS EMBLAZONED INTO EVERY DAY PLAY WITH THESE WONDERFUL FIGURES. THEY WERE SOME OF THE GREATEST TOYS EVER CREATED. IN 1991 FRESHLY MARRIED AND WANDERING AROUND THE ATLANTIQUE CITY SHOW, GARY STUMBLED INTO A BOOTH WITH LARGE BRIGHTLY LIT GLASS DISPLAY SHOWCASES. FOR SOME REASON BOOTH 2165 DREW HIM IN LIKE A MOTH TO A FLAME. AT FIRST GARY JUST STARED AT ONE PARTICULAR CASE, LOST IN THOUGHT. GARY JUST STARED AS THOUGH HE WAS MESMERIZED, IN A TRANCE. SLOWLY, DOOR AFTER DOOR STARTED TO OPEN IN GARY’S MIND AND HE RECOGNIZED WHAT IT WAS THAT HE WAS LOOKING AT. 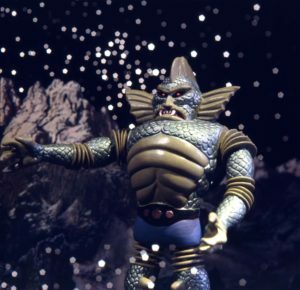 IT WAS ASTRO NAUTILUS. TO HIS RIGHT GARY STARTED TO STARE INTENSELY UNTIL HE REALIZED IT WAS XODIAC. 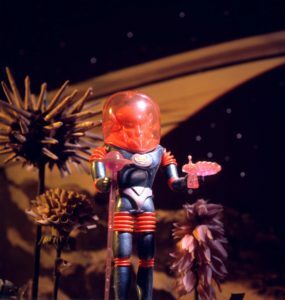 THEN ALPHA 7 ALMOST JUMPED OUT AT HIM AND WHAT GARY SOON RECOGNIZED WAS THAT HE WAS STANDING AND STARING AT A FULL MINT CARDED SET OF OUTER SPACE MEN. A VOICE CAME FROM BEHIND AND ASKED IF HE KNEW WHAT IT WAS THAT HE WAS LOOKING AT, THE VOICE ASKED IF HE PLAYED WITH THESE FIGURES AS A CHILD. THE VOICE WAS THAT OF MEL BIRNKRANT AND THE HOURS OF CONVERSATION WHICH THEN ENSUED WOULD CONTINUE ON FOR YEARS. A FRIENDSHIP THAT WAS MEANT TO BE FROM THE START FORMED AND ALTHOUGH MEL WAS MORE THAN TWENTY YEARS OLDER THAN GARY, THE FRIENDSHIP WAS FORGED. IT SEEMED THAT THE FRIENDSHIP BEGAN DECADES BEFORE WHEN THE FIRST SEAL WAS BROKEN ON GARY’S CARDED COLOSSUS REX. GARY WAS AT THE TIME A SPECIALIST ON THE FLOOR OF THE NEW YORK STOCK EXCHANGE, AND WAS MAKING HIS WAY THROUGH LIFE ON WALL STREET. MANY WEEKENDS WERE SPENT AT MEL’S HOME IN UPSTATE NEW YORK ENJOYING THE QUIET OF THE SUBURBS AND MARVELLING AT THE AMAZING COLLECTION OF A MAN WHO, FOR A COMPLETE LIFETIME, STUDIED, INVENTED AND BROUGHT TO MARKET AMAZING TOYS FOR GENERATION AFTER GENERATION TO ENJOY. MEL AND HIS FAMILY WELCOMED GARY WITH OPEN ARMS AND IN RETURN GARY CAME UP WITH AN IDEA AS TO HOW TO BRING BACK THE OSM TO THE GENERATION OF BABY BOOMERS WHO WERE CLAMORING FOR THEIR RETURN. GARY ASKED MEL IF HE HAD AN INTEREST IN BRINGING THE OSM BACK AND MEL GAVE QUITE A LOT OF SERIOUS THOUGHT TO THE IDEA UNTIL AFTER A SHORT WHILE HE SAID YES. IT WAS THEN THAT GARY SET OUT ON A MISSION, A TASK THAT TOOK GARY MORE THAN SIX YEARS TO COMPLETE. GARY OBTAINED THIRTEEN FEDERAL REGISTRATIONS ON THE FIRST AND SECOND SERIES OF THE OUTER SPACE MEN. 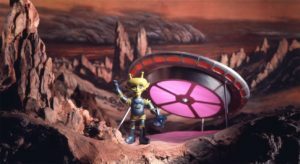 FIFTEEN REGISTRATIONS IN ALL INCLUDING THE TITLE “OUTER SPACE MEN” “THE WORLD OF THE FUTURE”AND “SPACE MARAUDERS” THEN CAME THE HARD PART. A DECISION HAD TO MADE WHETHER TO GO STRAIGHT TO NEW ACTION FIGURES AND WHETHER OR NOT TO UPDATE THEIR PHYSICAL APPEARANCE OR BRING THEM BACK FIRST IN A PRINT MEDIUM LIKE A COMIC BOOK OR A GRAPHIC NOVEL. YEARS WERE SPENT LOOKING FOR WRITERS AND ARTISTS THAT WOULD DEFINITIVELY BRING THE OSM INTO THE TWENTY FIRST CENTURY. A STORY HAD TO BE AGREED UPON AND AN ARTIST INTERVIEW PROCESS BEGAN. USING THE RESOURCES OF THE SCHOOL OF VISUAL ARTS IN NEW YORK CITY AND USING THE INTERNET THE ALL STAR TEAM WAS CHOSEN AND TO DATE THE STORY AND ART ARE UNPARALLELED. THE GRAPHIC NOVEL IS ON THE WAY LATE 2008. THE OUTER SPACE MEN LLC WAS FORMED IN FEBRUARY 2008 AND WWW.THEOUTERSPACEMEN.COM WENT ON LINE IN JULY OF THAT SAME YEAR. THE WEB SITE IS THE ONLY TRUE SOURCE FOR UP TO DATE NEWS AND THE ONLY TRUE SOURCE TO CONNECT WITH THESE WONDERFUL TOYS FROM YEARS AGO. IN THE FUTURE THERE IS NO TELLING WHERE THE OSM WILL LAND NEXT.